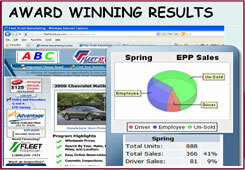 We know that Remarketing your Fleet Vehicles can be an overwhelming process. We have 30+ years of experience and knowledge to sell your off-lease and/or owned inventory by using a spectrum of wholesale and retail channels reaching all corners of the globe and simplifying your involvement in the entire process. We are YOUR Solutions Provider!! Please log in to access your inventory and run custom reports. Forgot your Client Id or Password? Forgot your Client Id or password? No worries! Please provide your name and email address below and we will send it over to you! Or you may call us at (800) 539-2277! Please feel free to call us at (800) 539-2277 or use the form below to send us an email and we will get back with you shortly! Fleet Street will design a remarketing solution that is completely customized to your fleet size and makeup. Our dedicated staff is motivated to sell your fleet inventory by finding the right buyers and maximizing returns for you! Our in-house IT department and cutting-edge technologies allow us to create comprehensive solutions quickly and effectively for your company. We listen. We understand. We solve. We build. You enjoy the benefits of a truly customized solution! Fleet Street Remarketing performs extensive market research, ensuring your vehicles are exposed to the right buyers globally. Our sales force is motivated to finding you the most returns for your inventory. Let us turn your problems into solutions! From difficult pick-up locations to unique inventory, acquired assets	or title problems, if it is part of your fleet and it needs to go, we will find a buyer for it and get it off your books! Our award winning Employee Purchase Program offers your employees a comprehensive buying experience and outstanding customer service. The result: greater participation and better results for your company! Remarketing a vehicle is easy. Profiling a vehicle to find the optimal marketplace is intelligent! Fleet Street makes consigning vehicles simple and flexible, from automated data feeds to using our secure online forms. We accept consignments via email, fax, phone or can upload entire spreadsheets. Our objective: a painless process that simplifies your involvement without compromising integrity. Our Employee Purchase Program has won awards for innovation and service. Our convenient, easy to use program eliminates your company's liability while creating no additional work. Fleet Street provides the complete Retail experience from financing to extended service plans. Fleet Street profiles every vehicle based on the condition, use, mileage and location. We then map this to our extensive database of historical sales, taking into consideration current market trends and various other influential indicators. Once identified, we focus our sales staff in those markets. Fleet Street will move vehicles to the right marketplace based on data analysis and sales profiling. Sometimes this means taking a vehicle a long way for the best ROI. Our network of reliable transporters allows us to keep costs down and make smarter moves. Fleet Street produces detailed online condition reports for every vehicle including photos. Once true condition is identified, Fleet Street will determine what to fix based on ROI. When financial responsibility influences decisions, your company benefits. Fleet Street's intelligent systems use vast amounts of historical and market data to identify best buyers and marketplaces. Integration with numerous online vehicle venues offer extensive exposure for maximized returns. Our sales staff is motived to sell your inventory, not just process it. Fleet Street's objective is to have vehicles off the books within 30 days of being available to us. Funds can be sent via wire transfer or check directly to the title holder for convenient and fast processing. Fleet Street will complete ALL necessary paper work, including the Client Sale Forms for your existing fleet management companies. We take the hassle out of the administrative and title processes associated with vehicle sales and handle it all for you! Fleet Street re-assigns all titles into our buyers' names eliminating ALL liability from our clients. Need a vehicle moved from one location to another? No problem! We have an extensive network of transporters that will pick-up and deliver your fleet vehicles from anywhere in the country. These transporters are fully licensed and insured and your vehicles are always hauled never driven. Missing vehicle title? No problem! Need title information corrected? No problem! Fleet Street's administrative staff are knowledgeable and eager to help with any vehicle title problems your company may have. Fleet Street ensures that all vehicles are properly de-identified. Pictures of the vehicles are taken before and after the process. Fleet Street will not send a title to our buyer without proof that the proper de-identification has been completed.